Super Hero Boy: Just when you thought you saw the last of her! Just when you thought you saw the last of her! I remeber when the Little Mermaid came out and what a commotion it made. It may have just been the single most popular Disney move of my generation. I'm sure even kids of this generation do not need an introduction to Ariel I always wonder whats behind the Disney characters I love. I mean its not like they just appeared one day (ok, maybe they did.. but I'm sure the writers had some sense of who the characters were before they just appeared in their Disney movies). Well, someone must have been listening as Ariel is back in a all new movie that depicts her life before the hansom prince, and the original Little Mermaid story. The first thing I want to say before anything else, this is a sequel movie and by tradition sequels are well sequels and with the rare exception they are usually less than shining than the original, however enough time has passed between the original movie and this new dvd so I think it should be judged on its own and not against the Little Mermaid. Sure Ariel is still the main character but the storyline is all to its own. The other thing I just have to say is the animation is the same as the original. Nothing gets me more worked up that disney classic drawn animation. I personally am not a huge fan of the 3D and 2D animations with again a very rare acception (Blizzard studios.. I love you..heh..) but still nothing is prettier than a classically animated Disney movie period.. sorry all those 3D animators out there. Enough of that rant though, I realize its a slowly dying art so I'm glad to see it when I can get it. Otherwise Little Mermaid : Ariel's Beginnings has a great story and a classically Disney great soundtrack. Ironically the movie is about a ban the underwater city of Atlantica puts on music. Seriously, think about that one for a second, Ariel the mermaid that breaks out into song at least every five frames, without music? Are you kidding? heh. Needless to say Ariel has her work cut out for her and with the help of my favorite lobster Sebastian and of course Flounder they are on a mission to get music restored to Atlantica. If you have a Ariel loving princess in your house.. what are you waiting for go and order your copy of Little Mermaid : Ariel's Beginnings on Amazon right now!! I have two copies of Little Mermaid : Ariel's Beginnings to give away to my readers! Leave a comment on this post. 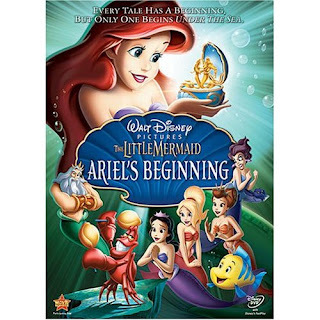 Check out Little Mermaid : Ariel's Beginnings and tell me what is your favorite Disney movie or character to date other than the Little Mermaid! This contest will end September 15th at midnight! We really like Tarzan! But they are all pretty great. I just loved Dr.Dolittle the old one. I loved both movies. Of course my most recent Disney movie I love is National Treasure 1 & 2. My personal favorite is Belle from beauty and the beast. I like her because she is more than just a beauty, she is a brain too. My favorite of all time (besides the Ariel) is Belle. :) Love the little mermaid though.. even had the sheets! Definitely Finding Nemo. It is just such a classic. I can't wait to see this. I don't think there is a Disney Film that I have never liked, my recent most favorite is Pirates of the Caribbean. Oh my gosh I love Beauty in the Beast, Cinderella, I have a list!!!!!! We love Little Mermaid, I bought it for my daughter when she was only six months old because I just HAd to have her have it. Thanks for the chance to win this. I love Belle too. The Little Mermaid is my fave though. Thanks for the chance to win! you are on my sidebar! Snow White has always been my favorite Disney character. My sons love The Little Mermaid!Their favorite is The Lion King because ofall the animals. I am sure they would love this one too!Thanks for the chance to win! I have always liked the dragon; Elliott, from "Pete's Dragon!" Gotta go with a classic: Cinderella. It's just such a great story. Uhh...TOugh call. There have been some good ones. I think maybe Toy Story is my favorite. Little Mermaid is MY favorite, and my dd Ashlyn's, but dd Lexie's favorite is Belle from Beauty & the Beast. so many to list, but I love The Genie from the Lamp. I tend to like side characters like Sebastian. Snow White is my fave! My favorite character has always been belle. How do you pick a favorite Disney movie or character? Trinity's favorite is Ariel, and she is begging for this movie since the previews started! I love all the Pirates of Carribean movies! Even have my own pirate costume! Shh!! Huge Mary Poppins Movie Fan but don't let my kids know that!! Our favorite Disney movie is Cinderalla. In Little Mermaid, definitely Flounder. Also love the Cheshire Cat from Alice In Wonderland. Sleeping Beauty/Aurora was always my favorite - thanks for the contest! Lion King is our favorite! I love Lady from Lady & The Tramp. Belle. Good head on her shoulders, that one.